The new EVM Metro LF directly wheelchair accessible minibus has a fully composite body. 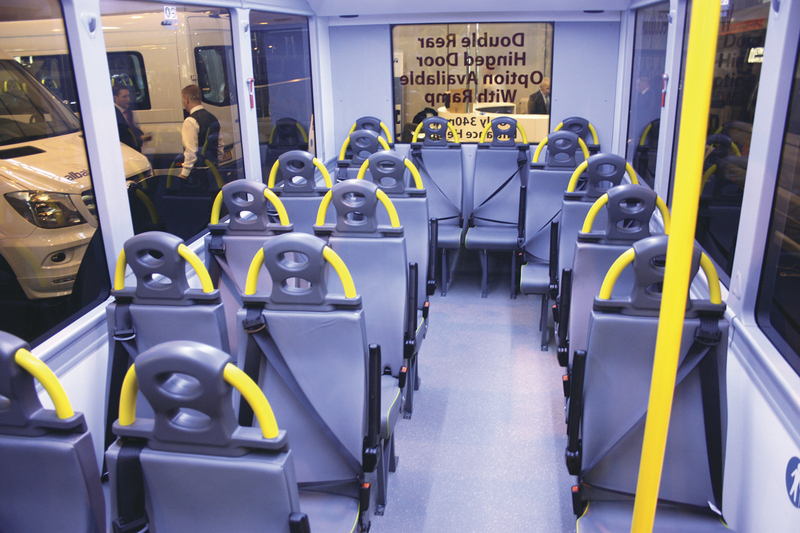 Interior of the new EVM Metro LF directly wheelchair accessible minibus. 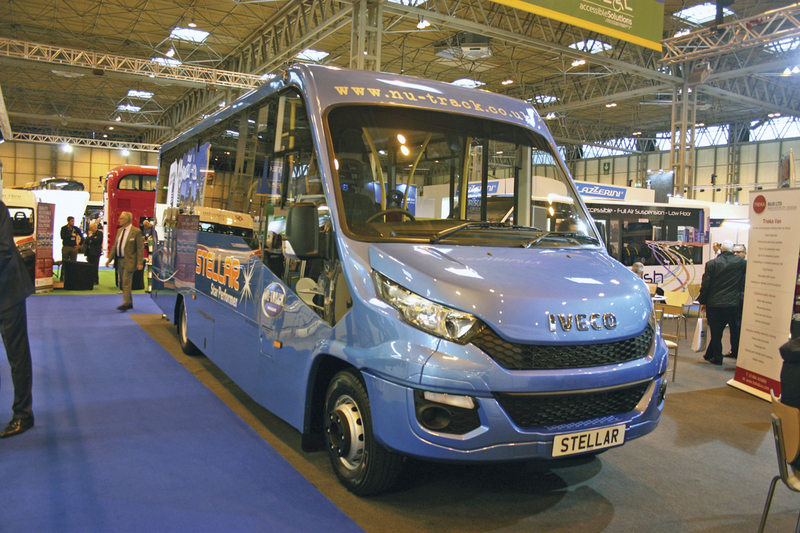 Launched at the Show the Nu-Track Stella based on Iveco New Daily. Unvi’s new Compa T 25 seater built on the Iveco New Daily. 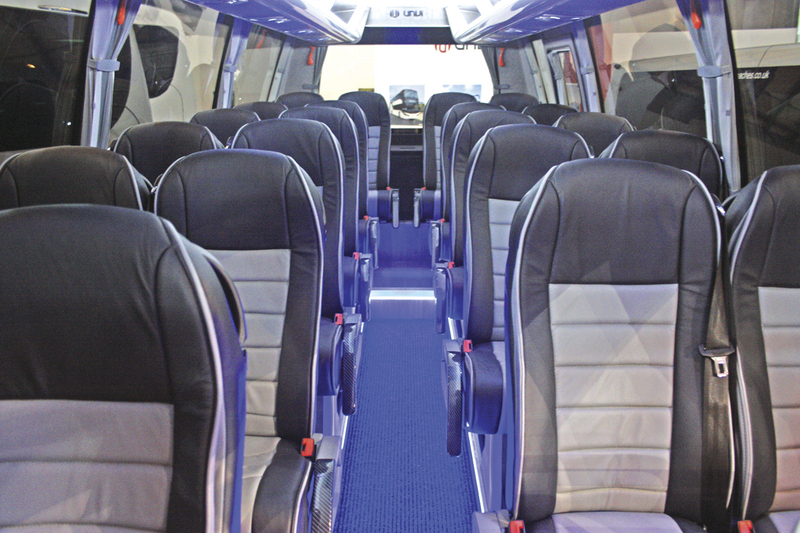 Interior of Unvi’s new Compa T 25 seater. Noones/MTM Turas 900 33 seater. 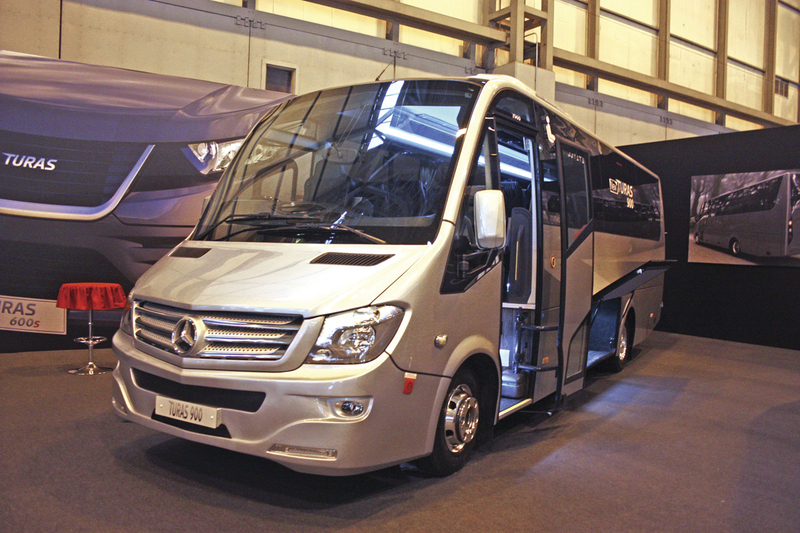 One of Mellor’s three new models the Strata LF. The stylish Indcar Next midi supplied by Moseley companies. Ferqui F5 39 seat midicoach supplied by Connaught PSV. Interior of the Ferqui F5 39 seat midicoach. The Iveco New Daily chassis. Super luxury Sprinter 519 X’Clusive by EVM. The Sitcar Voyager on Iveco which replaced the Beluga in the Moseley stable. 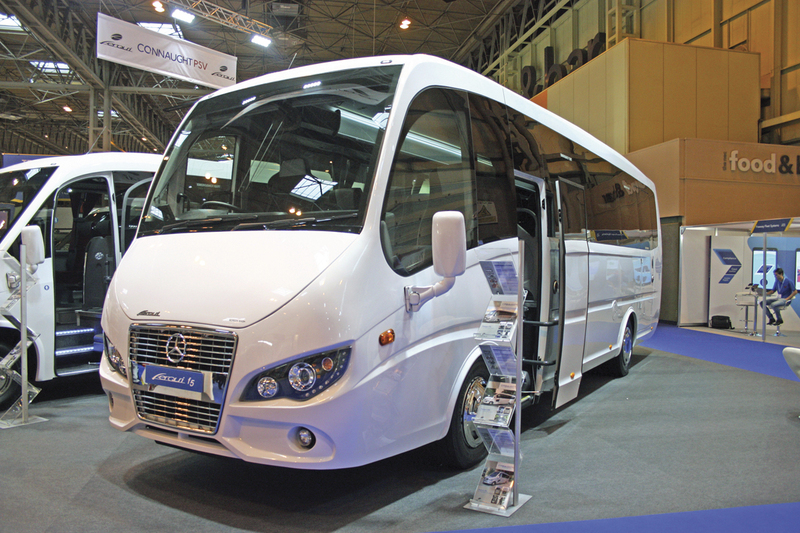 At the last Euro Bus Expo in 2014, the talk was all about possible replacements for the discontinued Mercedes-Benz Vario in the 33 seat category. A number of solutions were presented, mostly based on members of the Mercedes-Benz Atego chassis family plus a few other contenders. It was interesting to note which have come through and become established and which seem to have fallen by the wayside. Certainly the range of choice in the bracket has never been wider. This year the spotlight fell onto 25-33 seat sector where the Iveco New Daily chassis has emerged as a serious player. Over the preceding months and at the Show numerous examples based on that chassis have made their debuts. as is the falling value of the pound which impacts on virtually every supplier, either because their products are entirely sourced from Europe or contain a high level of content that has to be imported. Perhaps the surprise of the Show came once again from EVM with the Fiat Ducato based Metro LF, a directly wheelchair accessible minibus with an all composite body. It’s not a totally new product, the basis of it is the Plastisol composite body design we’ve seen before but as EVM have turned it into what is a viable product. We first saw the Plastisol body in the UK some years ago when TVAC, who already used the concept to build emergency vehicles for the blue light market, decided to apply the technology to the minibus market. They built a few buses of a strange angular design but TVAC was swallowed up by a blue light competitor Close Asset and it disappeared only to re-appear a couple of years later in the guise of the Optare Bonito which was not progressed. It briefly re-appeared under the O&H banner before again disappearing from view. So what is the attraction of the concept? It provides a single unit which is both lightweight and strong, easy to repair, not corroding and won’t leak however long you run it. Although EVM aren’t taking this line, previously one of its attributes was said to be that after some years of operating you could take the body off the chassis, refurbish it and put it back on a new chassis for a fraction of the cost of a new vehicle. That is what happens in the blue light market. What EVM have done with their acknowledged expertise is to take the basic concept, develop it and produce a thoroughly practical vehicle. We’ll return to it later when we look at EVM’s exhibits at the Show.. So to what was shown by the various exhibitors? Advanced KFS Special Vehicles was formed a few years ago when KFS Special Vehicles from Andover merged with Advanced Vehicles of Clay Cross. KFS had been building low floor vehicles for some years under the name Freedom, whilst Advanced were at one time a substantial builder of van conversion minibuses notably, as builders of vehicles which Citroen sold direct through its dealer chain. The Advanced KFS core business is specialist low floor maintenance vehicles for local authorities and contractors and single vehicle transporters but it has quietly continued to build a few minibuses. Recently it has set about re-building the position of the Advanced side of the business and now feels that it is time to tell people more about it. At the Show they exhibited a Fiat Ducato conversion built at Clay Cross. The basis was the Fiat Ducato 130 which is available with either manual transmission or automated transmission. The vehicle on show had seating for 16 passengers or alternatively two seated and four wheelchairs. Wheelchairs are loaded through the rear using a PLS underfloor cassette type tail lift. Of particular interest was the fold out step and handrail arrangement developed by the company. The quality of the conversion was very good. The MobiPeople Midi-Explorer is described in our large vehicle report. EVM had an absolutely crammed stand highlighting how this company has broadened its range over the years without losing its principles of building quality minicoaches. It continues to primarily build on variants of the Mercedes-Benz Sprinter. Two years ago it decided to test the water by introducing the Community/City a Sprinter with a lowered front floor section allowing direct wheelchair access. The move proved to be highly successful and the company have sold more of this type of Sprinter than they budgeted for. Since the introduction of the original model, a slight change has been made in that the single entrance door has been changed for a twin door set up. The vehicle provides the capability of seating up to 18 passengers with seating dropping by four when a wheelchair is carried. The wheelchair is carried in the conventional service bus position at the front behind the driver and for that reason seats in the wheelchair bay area have tip up seats. The example on show had been built for PassengerPlus of Ashford, Kent. EVM expanded its ‘accessible’ offering earlier this year by introducing the M1. This is a smaller vehicle built on the three tonnes Sprinter. It is fitted with eight tip and fold seats, a Bruan rear lift and a virtually hands free wheelchair securing system. The vehicle on show had been built for AirLynx of Southampton. As mentioned at the start of this article EVM, for the first time, presented a non-Mercedes-Benz based product in the shape of the Metro LF. This combines the Fiat Ducato Maxi front end with 3.0litre engine and six speed manual or automated transmission matched to a low line completely composite body, i.e no chassis frame. The vehicle has a completely flat floor and a very low step entrance of 245mm. It can carry up to 16 seated passengers and is available either in service bus form with solid back end and wheelchair access via the large front entrance or with tracked floor, rear doors and ramp for loading wheelchairs. Turning to EVM’s core business of practical minicoaches they showed a very nice example of their coachbuilt Grand Tourer with a very luxurious interior and all the usual bells and whistles. It was built on a 516 with automatic transmission. The coach on show was seated at 19 plus courier and had been built for Heathside Travel of Ferndown, Dorset. 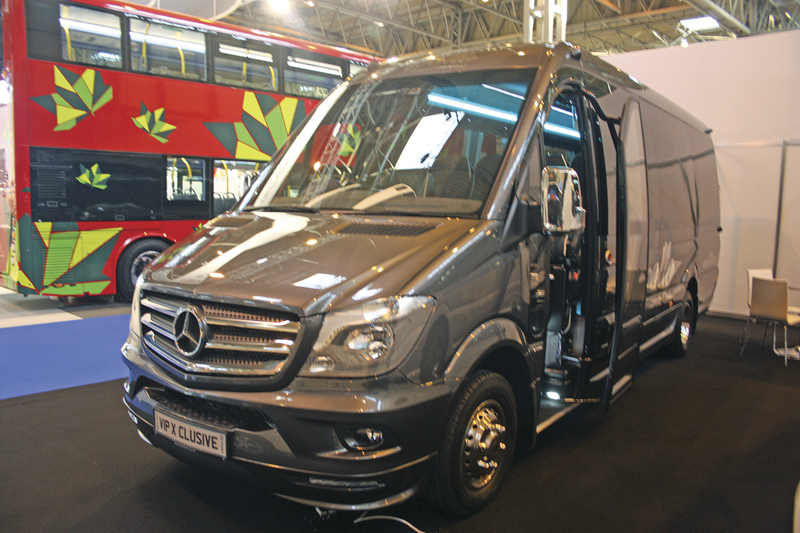 Another new variant at the Show was an Elegance standard Mercedes-Benz Sprinter 513 automatic fitted with a flat floor with tracked seats for 15 passengers. At the rear, it was fitted with a PLS underfloor cassette style wheelchair lift. EVM have not previously offered a conventional wheelchair accessible Sprinter in the UK although they have built them for Europe for some time. Representing the Avantgarde model was a 516 auto example with plug door and seating for 19 built for regular customer Alba Travel of Cumbria. Alongside it was another Avantgarde, again a 516 auto, but this time fitted with 22 seats for Laser Travel. Representing the top of the van conversion range is the X’Clusive luxury minicoach, the model that introduced the concept of glazed roofs to the sector. The vehicle on show was built on the comparatively rare, but fun to drive, Sprinter 519 with the V6 200bhp plus engine matched to fully automatic transmission. Built for Apollo Corporate Class, it was fitted with 16 luxury seats, some set at tables and a courier seat. EVM had another to a very similar specification outside the Hall which sold within an hour of the Show opening! The only model from the EVM range not present was the Cabrio which can convert into an open top vehicle. Danny McGee, Sales Director, EVM told me that they had sold more of them in the first year than they ever dreamed of and the only reason they didn’t have one at the Show was because all of the initial batch had been sold. 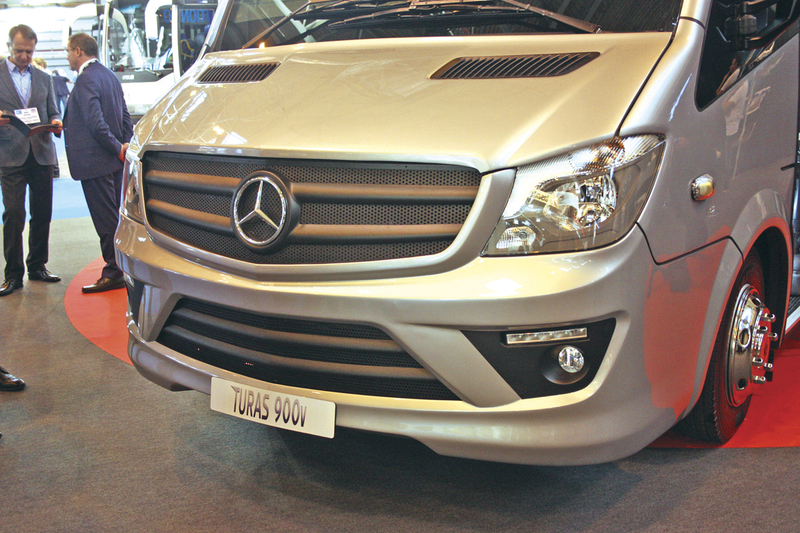 Evobus displayed two example from their range of factory built five tonnes Sprinter conversions. One was a City 45 with lowered front saloon floor and twin opening front entrance doors to provided sufficient space for direct wheelchair access. The wheelchair bay is located in the service bus position behind the driver and most seating in this area uses tip ups with fixed seating in the higher rear saloon. Total seating is 16 without a wheelchair but three of those are side wall mounted tip ups. The second vehicle was a Transfer 45. This had an extra step at the entrance and seating for 22 passengers. Both vehicles were fitted with automatic transmission. The Kentish based converter showed a Mercedes-Benz Sprinter 513. It was fitted with 16 track mounted Rescroft seats, climate control and a rear mounted Ratcliff-Palfinger cassette type tail lift. It also featured a camera on the nearside of the vehicle to prevent potential left turning accidents. Steve Peach who celebrated trading for 25 years this year, has brought together an excellent range of products built by the Spanish builder Ferqui, a popular manufacturer with British operators. The range consists of the Sorocco bodied five tonnes Mercedes-Benz Sprinter, the Iveco New Daily based SR and the top of the range Mercedes-Benz Atego based F5. All the vehicles displayed the very high standard of build quality for which Ferqui/Connaught are reputed. 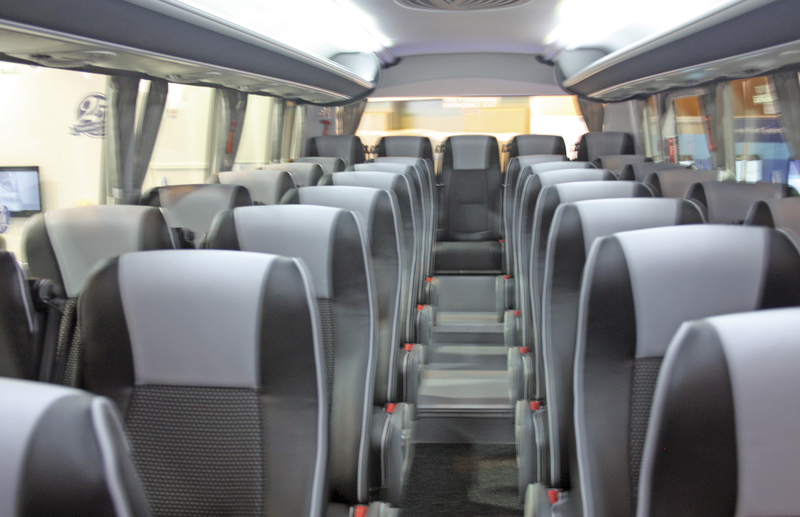 The Sorocco featured seating for 19 passengers plus courier and a large rear boot. It has been built for long established Connaught customer Wilfreda-Beehive. The SR can seat from 29 to 33 passengers and also features a large usable boot. The example on show was fitted with the Hi-Matic automatic transmission and seating for 29 passengers. The Ferqui F5 features an entrance behind the front axle and a large rear boot. Internal specification is high including air conditioning and luxury seating. The example on show was seated at 35 plus courier but the model can seat up to 39 passengers. The Devon based converter showed a Sprinter 514 manual conversion. It featured their fold out entrance step arrangement and seating for 16. It can alternatively carry three seated passengers and up to six wheelchairs. It was fitted with a PLS rear cassette style lift. The Moseley companies are the importers of the Spanish built Indcar Next midicoaches. I make no apology for saying that I like the styling of the Indcar Next, it is clean and simple. Built on the Mercedes-Benz 1224 chassis with rear air suspension, a range of models, interior layouts and equipment are available with features including a powered entrance door, a 6.8 cu m boot and air conditioning. On show was a Next L9, nine metre version with PowerShift3 automatic transmission and seating for 37 using Kiel seats. It had been built for Farleigh Coaches of Kent and the interior was specified to a high standard including a CCTV system. 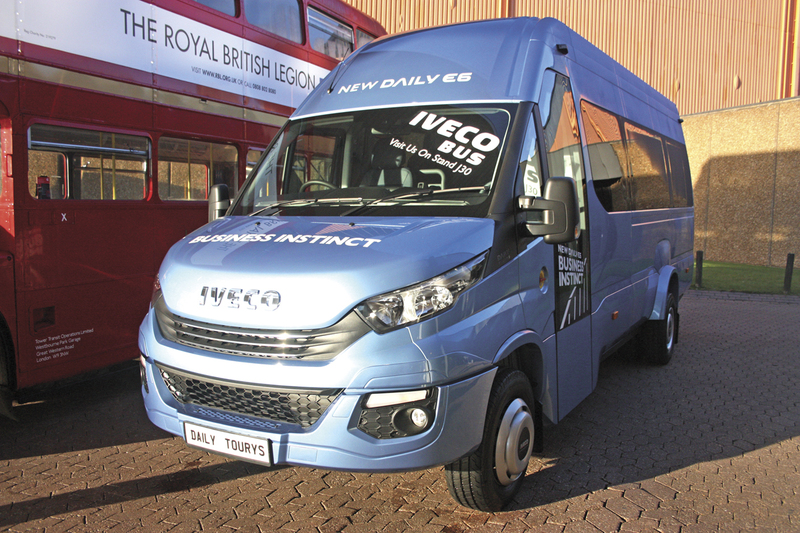 It is many years since Iveco (then Irisbus) exhibited in its own right at the Show, but such is the surge in interest in its New Daily range that they decided to do so this year. They presented a chassis scuttle for the 72C18 which is the most popular base for builders and converters and openly inviting people to come and talk to them about using their products. Outside the front entrance to the NEC, they also displayed a factory built Tourys minicoach based on the New Daily but unfortunately despite going back to it four times, I was never able to gain entry. I hope to redress that situation in the near future. 2016 has been an outstanding year for Mellor with three significant new models, all of which were on show. First was the Maxima, a coachbuilt version of the Iveco New Daily 72C17 capable of being seated at up to 30. The vehicle is available with either manual or HiMatic automatic transmission. It has a completely flat floor, powered entrance door and a rear mounted cassette style PLS tail lift for loading wheelchairs through the rear doors. Next came the Strata LF genuine service bus based on the Mercedes-Benz Sprinter 516 rated at 5.5 tonnes with a lowered front floor section, longer than most similar vehicles, allowing direct access for wheelchairs using the wide 950mm front entrance. The great feature of the Strata LF is that it allows 2+2 seating layouts to be achieved. Its maximum capacity is 22 (21 seated and 1 standee) or 18 seated, three standees and one wheelchair or 14 seated, six standees and two wheelchairs. The first examples are already in stage carriage service in Scotland with McGills. Finally came the just released Tucana II smaller directly wheelchair accessible minibus using the VW Transporter T6 front end matched to Mellors’s bespoke chassis and body configuration. The vehicle offers a smaller and notably narrower option particularly for rural work. It has a completely flat floor and a wide entrance with very low step height. Against most kerbs it is low enough not to need to use the manual fold out ramp. Versions are produced with a solid rear end and wheelchair access by the forward entrance or with rear doors and a fold out ramp. Various configurations of seating and wheelchair spaces are available. Maximum seating in the vehicle with rear doors is 14 whereas the vehicle with the solid back end can seat 15. 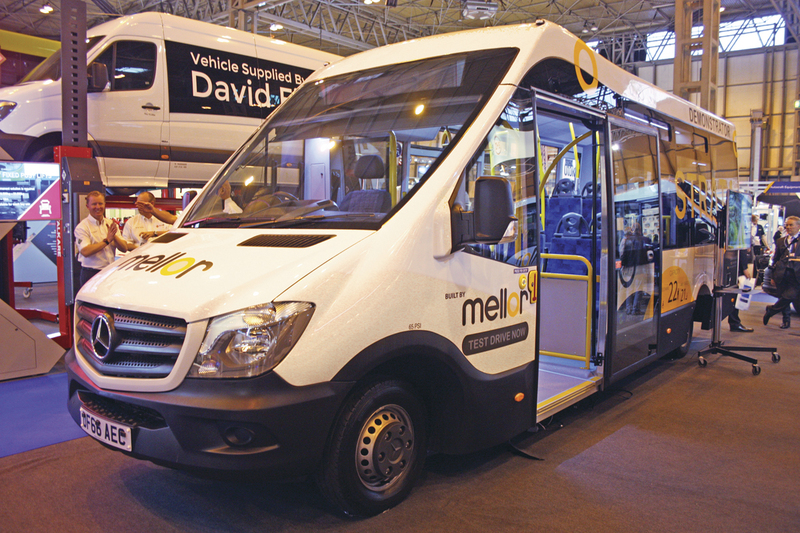 Not at the Show but a key model in the Mellor line-up is the Orion higher capacity directly wheelchair accessible flat floored model capable of seating up to 22 passengers. The Orion uses the Fiat Ducato drive unit matched to Mellor’s own body and chassis design. 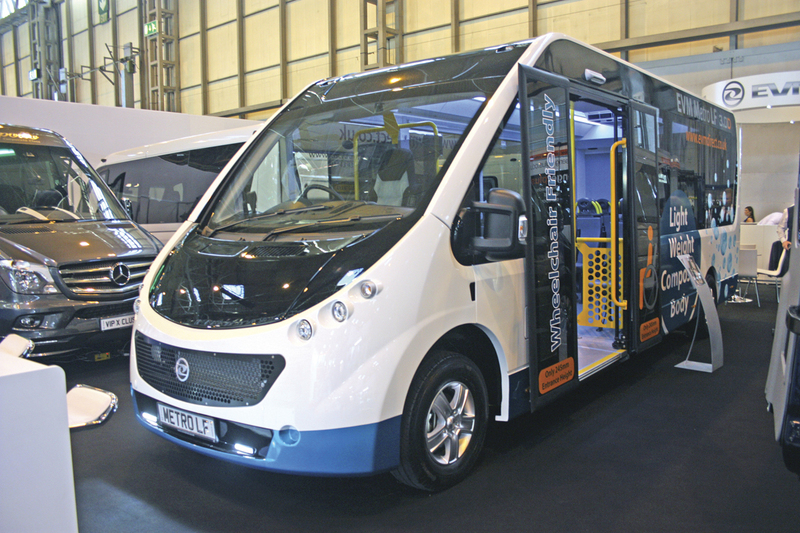 Mellor have built more Orions this year than ever before and production at the Rochdale plant is currently running at five vehicles a week, a high number being the service bus variant. This exhibitor took a radically different approach to the replacement of the Vario by taking an Atego nine tonnes chassis and effectively converting it from forward control to normal control. They did this for two main reasons, to keep as much of the forward mounted engine as possible out of the saloon for noise reasons and to enable the entrance to be placed alongside the driver and not as most others have done locating the entrance further back. It certainly caused a lot of discussion two years ago but since then the Turas 900 has become firmly established as a major player in the up to 33 seat sector. 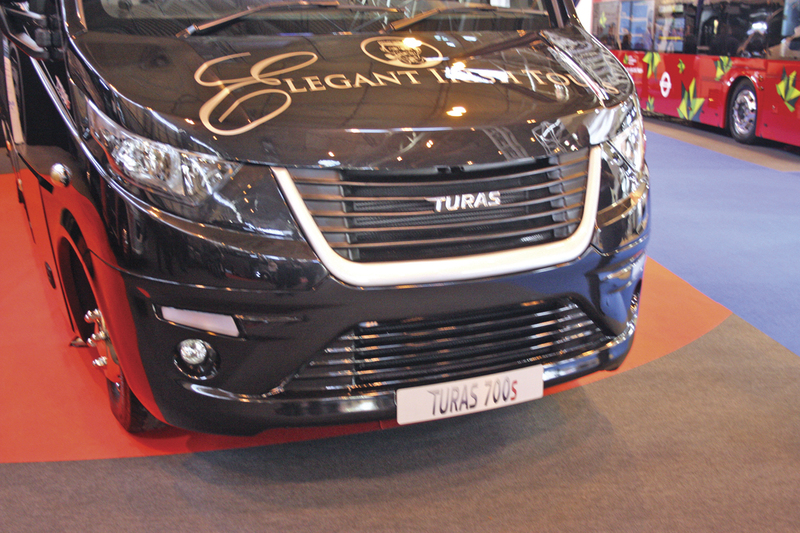 At the show they exhibited two examples, a Turas 900 and a Turas 900v. The Turas 900 was to the standard UK specification with 33 seats plus courier, large boot, power door and a high level of internal specification. The vehicle is available with either six-speed manual or the six speed Powershift 3 automatic box as shown. The second example, the 900v, is a new model especially developed for the Irish market to better fit the slightly different regulations there. The vehicle utilises the 918 Atego chassis and is only available with manual transmission. Other details include a standard Mercedes-Benz dash and steel wheels. It also displayed a revised front end styling which I felt tidied up the front end somewhat and which I expect to also appear on the standard Turas 900 in the future. A big difference is that the 900v will be built in Turkey and not as the 900 in Portugal. The 900v had seating for 33 and retained the large boot. The vehicle on show did not have underfloor side lockers but this will be a standard feature. It was destined for M&A Coaches of Ballyragget in Ireland. It would seem that going forward, their Turkish builder will primarily concentrate on 900 product for Ireland whilst the Portugese supplier will build most of the vehicles for the UK. There was to have been a new Atego based model on Show, the new Turkish built Turas 600. It is basically a shortened Turas 900 only available as a 25 seater plus courier and it comes with steel suspension rather than air. 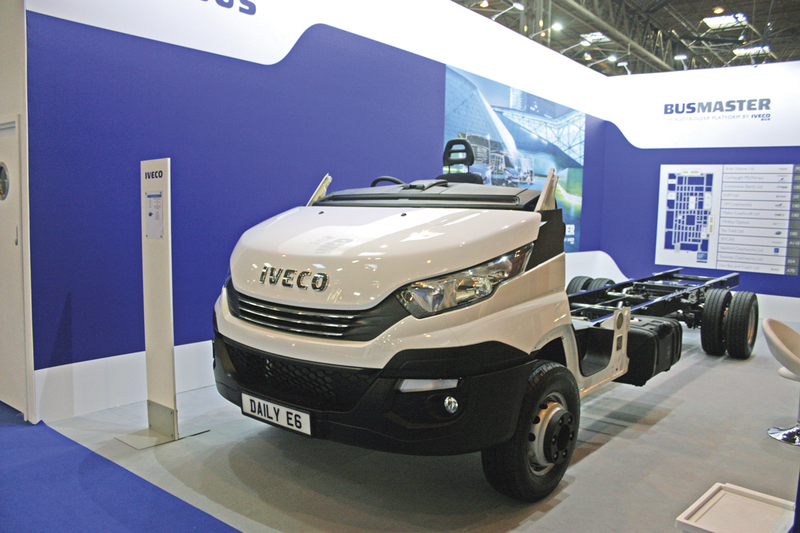 This supplier was one of the first to exploit the Iveco New Daily chassis, introducing the Turas 700. 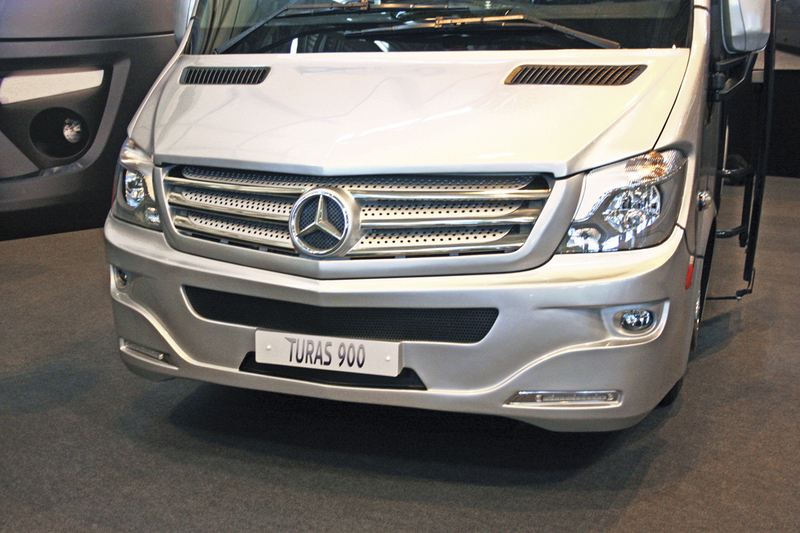 Most people opt for fitting the Turas 700 with 29 seats but it is capable of achieving 33 seats. This maximum seat figure is achieved despite the 7.5 tonnes GVW of the Iveco New Daily by the use of composite materials and lighter weight seating. 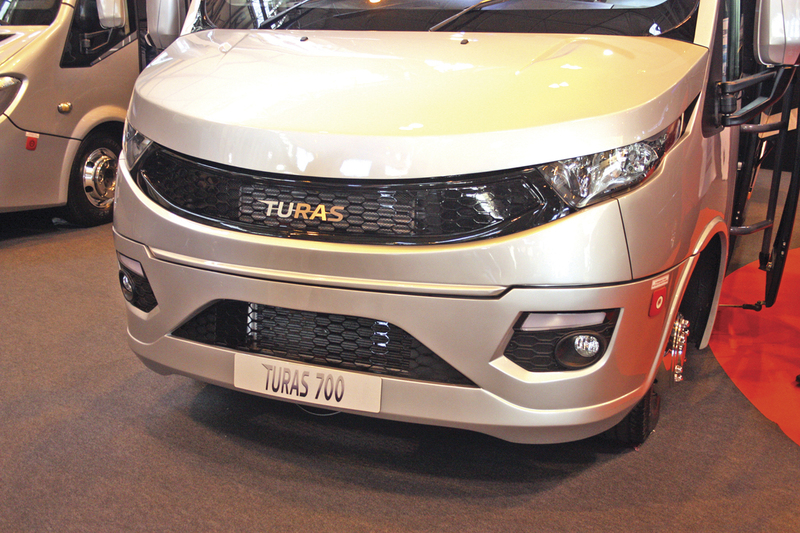 There was another new Turas 700 at the Show, the 700s. Again this is a slightly modified version to suit Irish regulations and it also sported a slightly revised front end styling but I understand that is not going to be washed over onto the 700. The 700s was destined for Irish operator Elegant Irish Tours. Outside the Hall, Noones/Minis-to-Midis also showed a Turas 500 Envoy Sprinter van conversion and another example of the Turas 700 with a very attractive interior. Nu-Track, the Northern Irish based accessible vehicle builder that is part of the Wright Group, presented a new model at the Show, the Stella. This is based on the Iveco New Daily 72C17 chassis with 170bhp engine and either six-speed manual or eight-speed fully automatic HiMatic transmission. It has a flat floor, powered entrance door and rear doors with a PLS underfloor cassette lift. It can seat up to 30 passengers or alternatively carry up to eight wheelchairs. Their other exhibit was a City Dash which marries a Fiat Ducato front end to an AL-KO low line chassis to give a flat floored, directly wheelchair accessible vehicle capable of carrying up to 16 passengers or alternatively up to six wheelchairs. The vehicle is fitted with air suspension all round. Wheelchairs can be loaded either through the wide, low front entrance or at the rear using a ramp. The vehicle can also be supplied with front entrance only and a solid coach type rear end. Nu-Track have introduced some interesting new products since joining Wrights which also include the MAN based Pulse up to 35 seat accessible and the StreetLite inspired flat floored, narrow bodied Nu-Vibe. All that activity has brought the company considerable success with production and sales rising steadily. Otokar vehicles are imported by Noones/Minis-to-Midis. On show were two examples of the Navigo T midicoach. Both were 8.4m long and built on a 10.5 tonnes chassis. They are fitted with the Cummins 180bhp Euro6 engine matched to Allison six-speed automatic transmission. One of the vehicles was fitted with a new push button gear selection system. They feature a forward entrance and despite the front mounted engine the entrance stairway is perfectly acceptable. The vehicles were equipped with a large rear boot and underfloor side lockers together with seating for 37 passengers and courier. Other features are air conditioning and a full entertainment package. The Navigo will interest rural operators because it is a compact package only 2.3m wide. Rescroft once again played host to an array of accessible minibuses from a range of builders including Mellor Coachcraft, Treka Bus/London Hire, TBC, Euromotive, Nu-Track and GM Coachworks. 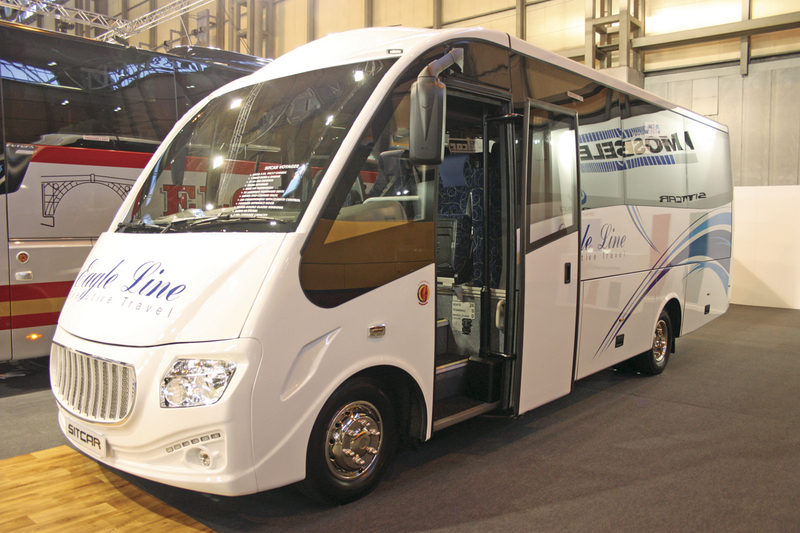 The Moseley group of companies have long been suppliers of midi coaches built on the Vario and produced by Sitcar. The Sitcar Beluga was a popular model for many years. That has now been replaced by the Voyager which is built on the Iveco New Daily base with 170bhp engine matched to ZF six-speed gearbox and Telma retarder. Other features include a power door, large 3.5 cu m boot and air conditioning together with a high standard of internal equipment. The example on show was seated at 25 plus courier and was destined for Eagleline Coaches of Gloucester. Displaying one of their seat ranges, Cogent Seating linked up with London Hire to incorporate on their stand a Citroen Relay minibus converted for London Hire by Stanford Coachworks. The vehicle is a new concept for London Hire offering a lower cost package to its largely Sprinter based fleet. The vehicle was built to the usual London Hire standard with flat floor, 16 Cogent seats, Koller fittings and a PLS rear cassette type tail lift. Swansea Conversions displayed two examples of their conversions of the Mercedes-Benz Sprinter. One was a Sprinter 516 automatic with 16 luxury seats, some set at tables. It also featured a glazed roof, powered entrance door and a large boot with powered lift up boot door. The standard of interior appointment was high. The other Sprinter was a less luxurious 516 seated at 16 with a good sized boot and plug door although it can be seated at up to 22. A conversion of the Iveco New Daily is also available with seating up to 29. TBC from Northern Ireland specialise in converting the VW Crafter CR50. They had an example on show built to comply with Regulation 107. It had a front entrance with a Stem extra step and a capacity of 16 or up to six wheelchairs loaded at the rear by a Braun Vista in-board tail lift. Temsa had one exhibit in this sector, the MD9 described in our large vehicle report. 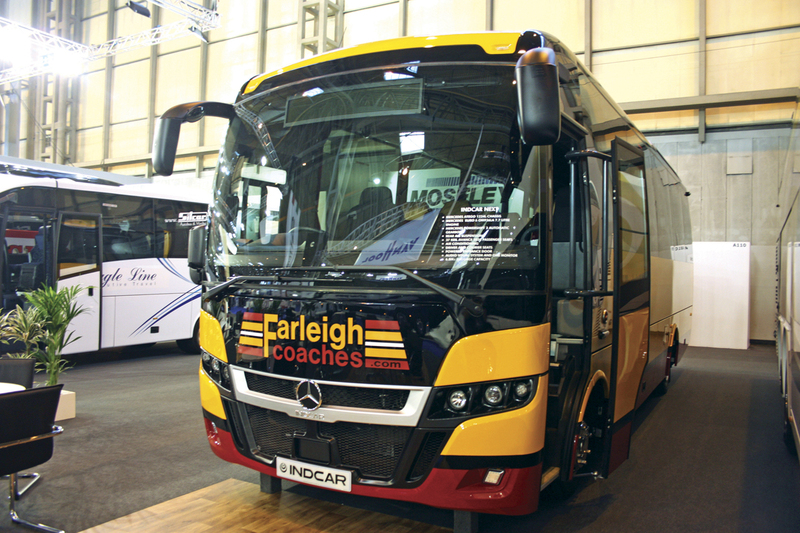 In a joint exhibit, Treka Bus displayed one of their Treka 16s destined for London Hire. Treka Bus build Treka 16s either as coachbuilt units or as van conversions, shown was a van conversion of a 514 Sprinter. The vehicle had 16 Rescroft CT Lite-Space seats or alternatively space for up to six wheelchairs. The vehicle featured a larger than usual extra side step at the entrance and a comprehensive CCTV system both inside and outside plus an audible left turning feature. Wheelchairs are loaded at the rear using a PLS cassette type lift. The vehicle was one of a batch of 30 built by London Hire for operation by Oxfordshire County Council. Unvi came to the show with a completely new model, the Compa T is built on the Iveco 70C18 New Daily but is also available on the 21 version with 210bhp. Both manual and Hi-Matic automatic transmission versions are available. The 8.5m vehicle can seat up to 25 plus courier and is equipped to the high standard of internal specification for which Unvi are renowned. Other features are air suspension, power door and a large rear boot. 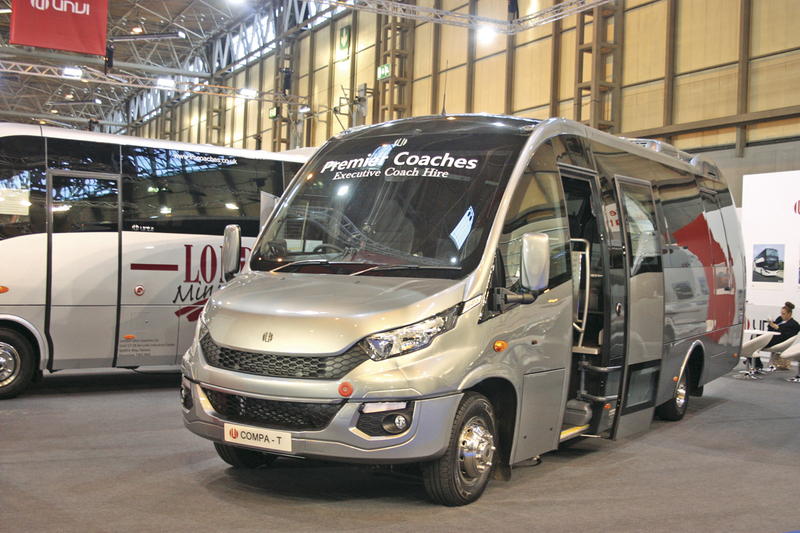 The example on show was built for Premier Coaches. Although the Compa T is new to the UK, the basic design has been in production by Unvi for some time (including on the previous Iveco Daily chassis) for customers in Europe. Unvi’s Vario replacement is the Voyager built on the ten tonnes Mercedes-Atego chassis and available with either manual or PowerShift 3 automatic transmission. Since its introduction two years ago, its rather controversial styling has been ‘adjusted’ and it is now more in line with Unvi’s usual style. It has proved to be a popular vehicle with operators, equipped to a high standard and featuring a large boot. The Voyager is available with seating up to 34 plus courier and either 211 or 230bhp. The vehicle on show was built for London Minicoaches. Not displayed but announced at the show was a version adapted to allow the carriage of wheelchairs. The smallest vehicle on the stand was an example of the five tonnes Sprinter based Vega GT which Unvi build in both coachbuilt and van conversion form with seating capacities up to 22. The example on show was seated at 19. The model can be supplied with 163 or 190bhp power outputs and either six-speed manual or seven-speed fully automatic transmission. The vehicle shown had been built for London Minicoaches. Top of the Unvi range are the Touring midicoach models with rear air suspension, the GT and the GTR. The 10.3m GT uses the Mercedes-Benz Atego 1524 chassis with either 238 or 272 bhp matched to six-speed manual or PowerShift 3 automatic transmission. It provides seating for up to 41 passengers or 37 plus rear saloon toilet. The vehicle on show was being supplied to Rose Travel in Ireland. The largest of the Unvi’s is the GTR rear engined midicoach based on 15.6 tonnes MAN components. Powered by a 290bhp engine matched to ZF EcoLife automatic transmission, it can seat up to 43 or 39 plus saloon toilet. The vehicle on show was fitted with 39 seats plus toilet and had been built for Castle Executive. The Yutong TC9 midi coach imported by Pelican Bus and Coach is described in our large vehicle report. Euro Bus Expo always provides a mouth watering array of vehicles to drool over and as ever a few surprises!